Growing up as a kid, the one thing you never wanted to show was that you could be easily taken advantage of or manipulated. Once the local bullies recognized a weakness, they would attack without relenting until you eventually fought back. After the free-agency fiasco with DeAndre Jordan, it seems as if the rest of the NBA has recognized the Dallas Mavericks weakness — that free-agents aren’t completely sold on playing for the Mavs — and teams are trying to take advantage of it. 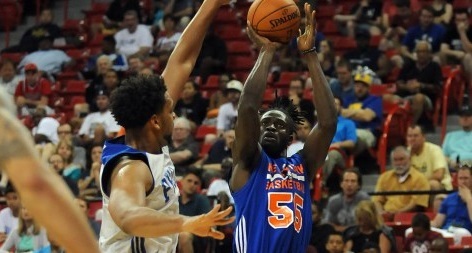 This time it was the New York Knicks and the pursuit of undrafted free-agent Maurice Ndour. Ndour, a 6’9 forward from Ohio University, impressed many scouts while playing for the New York summer league team in Las Vegas a couple of weeks ago and he instantly became a hot commodity. Despite having the inside track on Ndour, Knicks team President Phil Jackson and GM Steve Mills miscalculated Ndour’s value on the open market and only offered him a $200,000 guaranteed contract. After missing out on other free-agent targets who could become the team’s next Jae Crowder or Al-Farouq Aminu — a high energy swing forward that plays defense and occasionally hit an open jump shot — the Mavericks liked what they saw in Ndour, made a more substantial offer of $600,000 and Ndour verbally accepted. But that did not stop the Knicks from trying to sway the young rookie to remain in New York. Despite overtures made by the Knicks to retain him, Ndour, unlike DeAndre Jordan, was a man of his word and eventually signed the contract with the Mavericks. But you have to wonder if an unsettling precedent is being set against the Mavericks; will we see more teams continue to negotiate with players despite them having an oral agreement with Dallas? The only way to stop being punked by the neighborhood bully is to fight back and its time for the Mavs to start punching back. Team owner Mark Cuban has never been one to back down, so it should be interesting to see how he handles things moving forward — but at least this time they got the guy they wanted. ← Is there a Double-Standard for Commits at MSU?